Children read by candle light due to limited hours of electricity in the Gaza Strip. As protests continue at the Gaza border fence against Israeli policies, so does the killing and wounding of Palestinian protesters, including children, by the Israeli security forces, said a UN independent human rights expert on Tuesday. With the death toll rising, the UN Special Rapporteur who monitors the human rights situation in the Palestinian territory, denounced the violence as an “ongoing affront to human rights and human dignity”. As the humanitarian situation in Gaza continues to deteriorate, tensions are rising in the Strip. 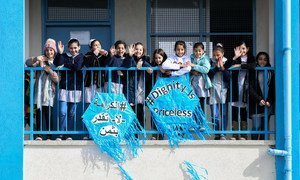 On Monday, the UN Relief and Works Agency for Palestine Refugees (UNRWA) temporarily withdrew part of its international staff from Gaza following a “series of worrying security incidents affecting its personnel”, including harassment by individuals protesting recent measures resulting from UNRWA’s limited funding. 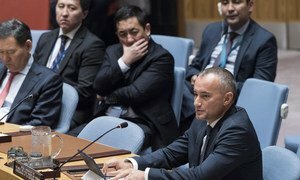 However, the agency continues to carry out its relief operations to the best of its capacity and several international staff, including the head of operations, will remain in Gaza.